Updated 9/24/2017 Episode 158: Stampede of Countless Demon Rats. Cut 256. It’s a difficult moment for him: he genuinely wants to stop the rat plague, but he knows that doing so will reveal his secret and make it impossible for him to get another chance to kill the evil master he hates. So when Sango shows surprised anger that he is responsible for the rats, he simply glares back at his sister, pretending that he’s no more than Hakudoshi’s loyal minion. (But the glimmering eyes tell another story.) This image appears at 21:43 of this episode. 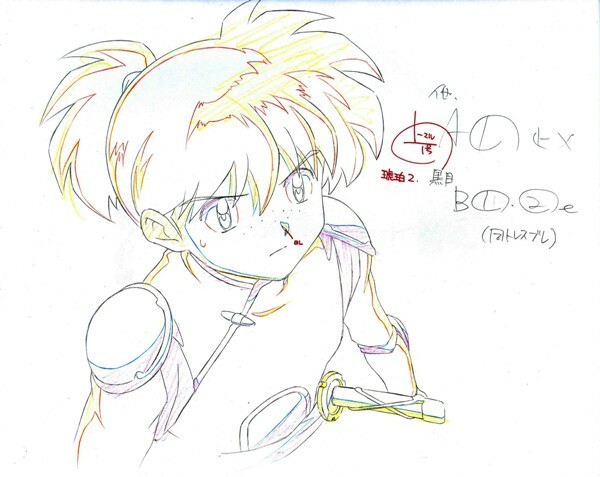 Above is the fine rough of this A1 END image by animation director Shōko Ikeda, with the finished genga in the first thumb and the copy layout (I believe also Ikeda’s work) with Ishihara’s stamp added. It’s interesting to note that my Episode 163 layouts bear stamps dated between April 24 and May 10, 2004. This one from Ep. 158 is dated March 30, showing that Kyoto Animation was working on this episode about a month before. As Ep. 163 is five episodes later, it makes sense that Ep. 158 was being sketched out five weeks earlier in the production schedule. But of course, it took much longer than a week to complete the animation of any single episode (though the Ishihara-tachi obviously worked quickly as well as elegantly). And the process was subject to delays. In fact, seven weeks passed between the first public broadcast of this show (July 5, 2004) and the later one (August 23, 2004). So it becomes obvious why several studios and several teams needed to share the task of delivering episodes of any major series on time to be broadcast in their proper order. 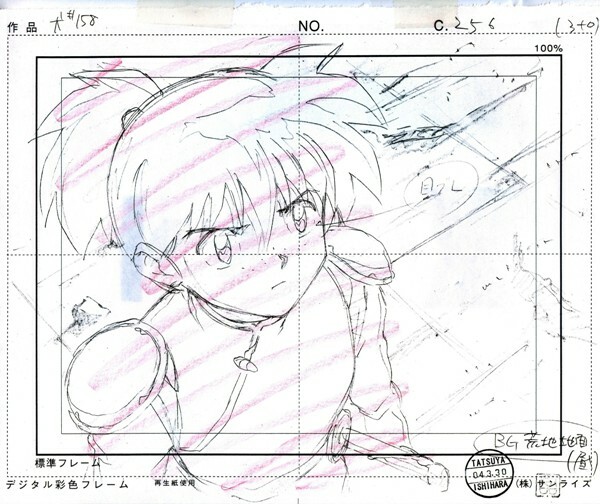 Still, given the numbers of special “tribute” episodes that were fitted into the original CCS schedule and the many “flashback” episodes that hold back the progress of Chobits, one suspects that this system worked better as a plan than in actual practice.